As the well-known verse from Ecclesiastes tells us, “To everything there is a season, a time for every purpose under the sun…” The Jewish calendar is not random but an ordered progression through the wheel of the year, with holidays falling at their proper time: Hanukkah, the Festival of Lights, at the darkest time of the year; Pesach at the time of new beginnings and Sukkot at harvest time. The cycle of seasons also yield secrets of healthy living to keen observers of nature. Ancient and modern healing traditions advise living in harmony with the seasons. Judaism provides us with a shortcut to understanding the seasonal imperatives in the symbolism of the four elements. Each element corresponds to a season: fire/summer; water/winter; wind or air/spring and earth/fall. The oppositional relationship the Koshnitzer Maggid refers to is described as the Inner and Outer aspects of each season by Rabbi Jill Hammer in her book The Jewish Book of Days. For example, the Outer element of Summer is Fire, since Summer is characterized by heat; Water, the Inner element, provides the balance to keep the fire in check so it doesn’t get out of control. 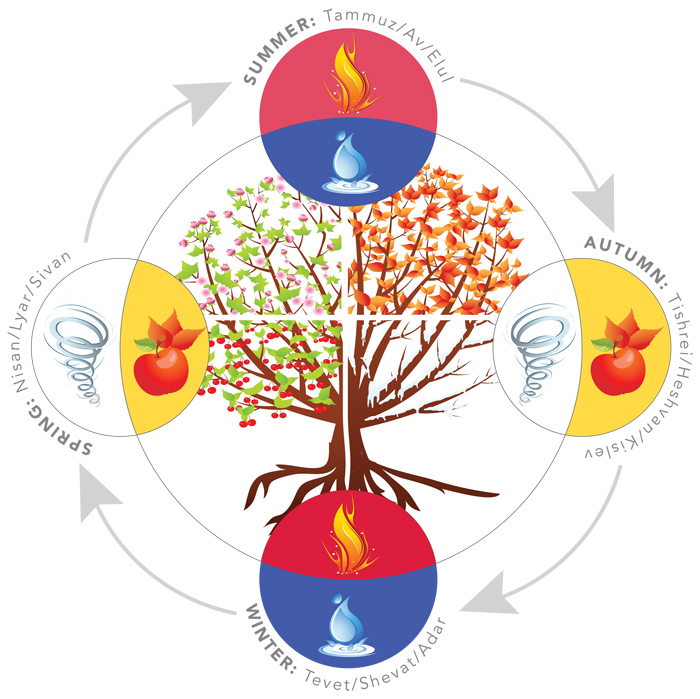 The chart below is a graphic illustration of the relationships of the elements to the seasons and months of the year.